Kevin: There's an interview with Rene Auberjonois on the DVDs for this season where he talks about developing the character, and at one point telling the writers to stop writing in the "hrmphs" for him and that he would know where to add them. I bring this up because this episode lives or dies on how well it overcomes the obvious hand of the creators. The writers, understanding they have two very talented actors with great chemistry obviously want to put them in situations, but the story should always be able to stand on its own. I think this episode largely does. The back and forth that culminates in accusations of being either a FAILURE or a FASCIST were great, and in true Quark fashion, he nails what really bothers the other characters, just like he did with Sisko in Jem'Hadar. As comedy, it is successful, and I think it largely justifies its own existence, but even to the extent it doesn't, the comedy is good enough to make me not care that much. Matthew: I stipulate to all the aforementioned appreciation of Quark/Odo comedy. Whether or not it was too on the nose at times, it was enjoyable. My problem is that the setup was so inconsequential. Quark is going to a hearing somewhere far away. They made noise as though this was Odo finally "getting his man," but the story really didn't explore any of the potential consequences of such an event. And so it was just kind of "Quark and Odo go on a field trip somewhere, hilarity ensues." That's not really enough for me, personally. Kevin: This, oddly, was a better outing for exploring the limitations of Odo's new solidity that Apocalypse Rising. Not only would he have easily saved the day as a Changeling, here, he's really just a burden. He even breaks the leg he now has. Quark would have gotten farther faster from the beginning without Odo to have to share resources with. I think that could have been the more profound line to draw. Odo could have really had to confront some things about who he was and is and really make some tough choices. I liked the Jake/Nog plot well enough, but had they jettisoned it in favor of digging more into Odo's near-death experience, I would not have minded. Matthew: Yeah, the basic friendship-building aspects of the story were pleasant. Kevin: The Jake/Nog story is as related to the A plot as it always is, which is to say, not at all, but hey, this has come a long way from hijinks about stembolts. I like the very relatable experience of seeing a friend, particularly one from adolescence and seeing how the different versions of yourselves fit together. I think the turned up both Jake's slovenliness and Nog's drill sergeant shtick a little too much, but overall, for what it was, I liked it a lot, actually. Seeing Sisko pull rank on both them in the name of preserving a friendship he understands, now, to be of value, is really interesting, and I like seeing a glimpse of what life is like for non-Starfleet officers. I kind of wish they had made this its own episode in a way, and really dug into that idea. 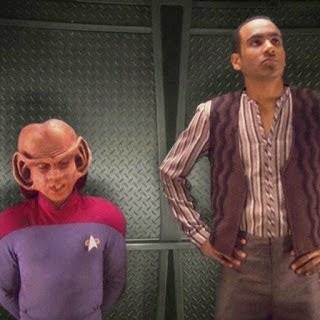 For Nog, the opportunity and structure of Starfleet is a gift, for Jake, one of many choices he could make, and ultimately walked away from. Somewhere under the Odd Couple riff, there's a story about humans in this world, and I would have liked them to find it. Kevin: It may be obvious the episode was designed to provide a platform for the comedy we got, but that's kind of like complaining the Central Park does Shakespeare every summer. You're not going for an original story; you're going to see good actors find interesting ways of telling it. The comedy rhythms are spot on, and the pitch in their performance increases well. As they get more desperate, they get more combative, and it is a hoot to watch. Part of what keeps the episode grounded was the delightfully understated reaffirmation of their mutual hatred at the end. It was cute without being saccharine. Matthew: Yeah, there's not much to criticize on this score. Shimerman and Auberjonois have honed their chemistry to a fine edge, and it is on ample display here. They make dialogue that might otherwise seem pedestrian work well on the screen. Playing the hatred aspect is a tricky one, too. If it comes off too negatively, we might be turned off. They have to make the hatred so close to love and camaraderie that we enjoy it either way. Kevin: I liked both Lofton and Eisenberg. They have good rapport and they both did a good job of letting the characters their adult selves were becoming infuse the interactions. It's not Olivier or anything, but as "slice of life" it gets the job done. Matthew: Eisenberg is, as usual, better than Lofton, with more shades to his officious prick than Lofton's feckless loser. Part of it is the writing - the script never gave Jake a chance to appear as anything but a lazy bum. Kevin: I want to single out Shimerman for one scene in particular, the one where he thinks he's going deaf in one ear. It has me rolling every time I watch it. Kevin: Who doesn't like a field trip? And it's not even to Bronson Canyon this time. Mt. Whitney was great and beautifully shot. The camera work they did to make the apparently 60-degree vista appear frigid was great. It felt cold to watch. I also liked the bomb in the runabout. It was a good prop. Matthew: The location work was indeed the best part of the show. I will say that they didn't have a great variety of mountains settings, and things never looked that steep. Nonetheless, it was pretty to look at. I liked the set dressings on Jake and Nog's apartment. Kevin: To the extent the episode was contrived to get a fun comedy outing between two antagonists, I don't mind it. I am suitably entertained throughout, and I got more than one decent chuckle. Maybe they could have dug for something deeper, but as it stands, I am entirely comfortable giving this a 3. Matthew: Frankly, I thought the Jake and Nog story was a bit more engaging than the A story. It just didn't have any feeling of consequence, and I was subsequently a little bored by it. Fine acting overall brings this to a 3, which makes out combined total a 6..